What are those birds singing about? Find out as KBCS’s Yuko Kodama talks with Ed Dominguez, Audubon Lead Naturalist, in Seattle’s Seward Park. 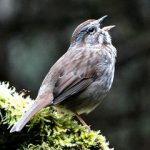 They discuss the different types of songs that birds sing as well as their motivation for singing.